This Car looks like a heck of a deal for $18,000.00 What am I missing? Is it the something about the Thunder Ranch build ? This is the same car you asked about in this thread last July. Interesting that the Dynamat is not there in the Samba pics. Beautiful car but the problem is the original car said rebuilt title. There's quite a bit differnet or they have moved around in the engine bay besides the dynamat if that's the exact same car. This one looks like a good deal if its legit? There's too many differences for them to be the same, it's possible, but I think there are too many differences. 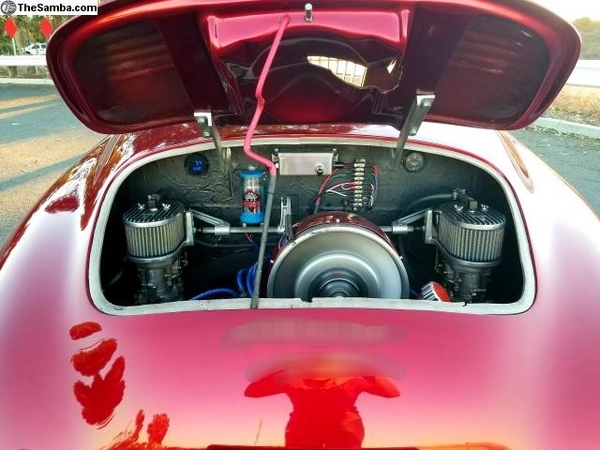 The carburetor tops are different, the engine surround material is different, the top car has a color matched oil filler cap and the bottom one isn't, the seal around the engine lid and body is different, two different coils, and the hood prop is missing. 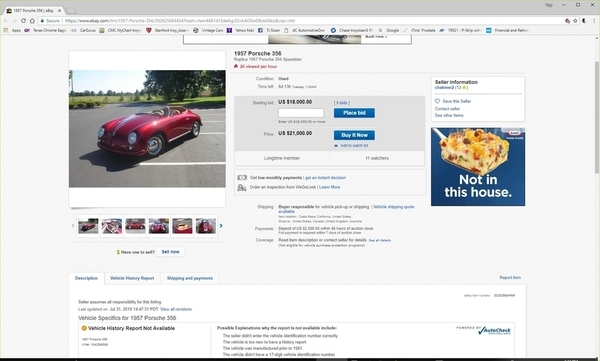 It's been for sale on different sites for more than a year. With all the people looking for good deals, there has to be a reason it hasn't sold. It's the same car Robert. It does look like a few things have been changed, but it's the same car. I have a copy of the last ad on eBay. Same city, same seller, all the same. Begs to question then, "Why all of the changes to the motor?". I'm just speculating, but perhaps to get it sold? 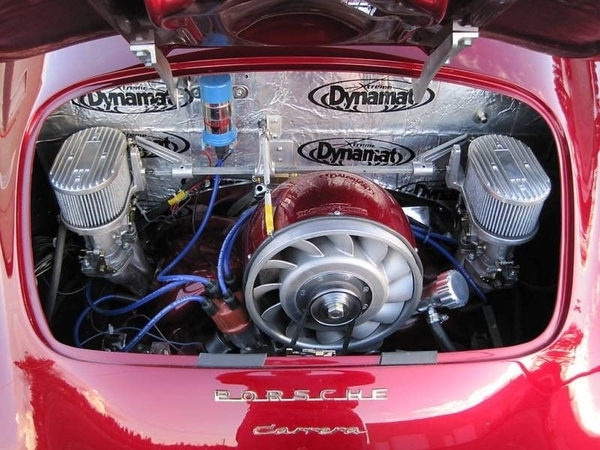 The Dynamat engine compartment looks like a framed house, wrapped in Tyvek because the owner didn't have them money to side it. The new engine bay treatment looks like it's finished, at least. I thought the car looked familiar. I assume there is something going on with this to keep it from selling. A salvage title wouldn't bother me on one these cars if it was as good as this car looks for the price. Something else is going on with the car I bet. It does look good in the pictures. Does anyone know of anyone who has looked at the car? I prefer to not fight such a bureaucratic hassle myself. True dat Ray. But I believe the ad said this car has a salvage VW title. This is NOT the same car as the posting in July. I am the one selling it and thus is the very first time EVER I have used Samba. I did have it listed on eBay but found difficulties with that site so I just recently posted it here (in November). This car DOES have a Salvage title. I am the seller. It is NOT the car in any previous posting on Samba and NO engine work has been done. 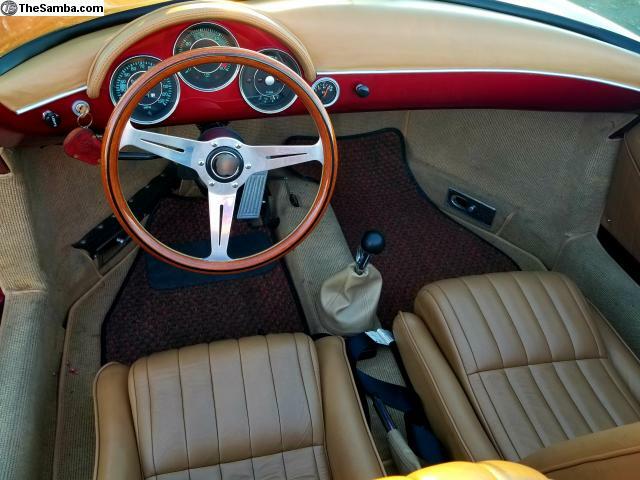 Yes, MotoCarlo, in some states the salvage title requires more hoops for sure! I had this car registered in Colorado before CA and it was easy there. It took me over 1 year to register in CA but it passed all inspections (including Smog) and good to go in CA now. This is exactly the way it was from the builder when I purchased the car 8 years ago. No recent changes to the engine compartment or engine. 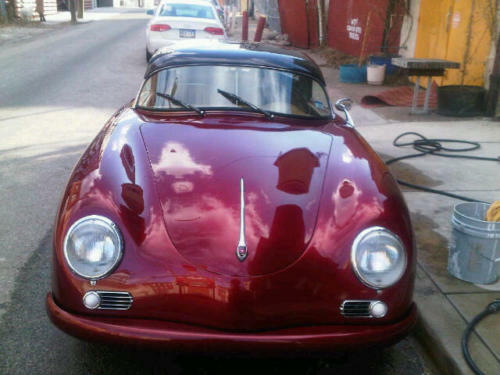 @RobertM-- I did have this car listed on eBay in short intervals but NEVER on Samba. EBay kept taking it down due to "trademark violations" so that is why it did not sell there. That is why I recently (in November) posted this car on Samba. I am the seller. This is NOT the same car. Thanks for the clarification. Good luck with the sale— it’s a beautiful car. I'm totally confused now. This seller's name is Rebecca and the person I spoke to last July and Jimmy also spoke to about a Candy Apple Red Thunder Ranch for sale on eBay (not Samba) in Orange County, with a salvage title, with the same VIN # and a hardtop that didn't fit correctly and 4,200 miles was also named Rebecca. WOW, that's a pretty big coincidence, but if it's not the same car it's not the same car and I stand corrected. I still agree, it's a nice looking car. I agree. I love everything about the car. I am a lover of the House of Kandy Candy apple red paint. It looks amazing. I like the engine set up ( even if it is VW). It looks like one heck of a deal for $18K. The other car thing remains a mystery. Rebecca. What is your profile name on eBay? It may be one of the listings that are too good to be true because they are fake and lead you into a scam. I would proceed with caution. To bad someone isn't in the area that could investigate. I love a good mystery. Let’s see if I can clarify things here. Boy conversations get out of hand quickly. My name is Rebecca. 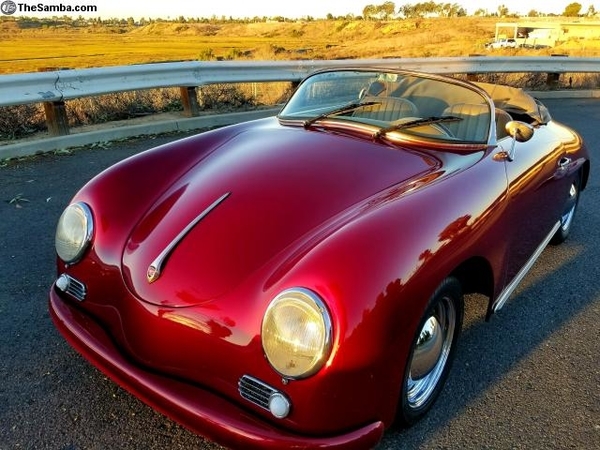 I have the 356 that is the topic of this email. I did have it listed on eBay. This is the first listing on Samba. I was selling on eBay (eBay name chakmer2) for a Buy It Now at $23,000 and a starting bid of $19,000. Before the auction completed I had a representative from Porsche pull the listing off because of Trademark violations. I tried to correct the violations yet they did not even look at the subsequent 2 additional times I listed it and just pulled the listing before the auctions ended (regardless of smudging out the emblems, etc). That is why I listed it here in Samba for the first time in November. If all of you want to give me more money for this car, I’m happy to take it. I’ll change the list price to >$18,000. I invite any and all of you to come test drive yourself. I live in Costa Mesa and am motivated to sell so I don’t have to pay the registration again and insurance for the next 6 months. Please email me or text if you have a true interest in this car. This is not a scam Jimmy. Come see it. Sorry for any confusion. As mentioned in other replies, I did have it on eBay. Not on Samba. I did not see that the link was to an eBay listing. Yes, I did have it on eBay (please refer to my post re: that). I will be happy to show the car to you if you are interested in it. Please email me if you have a serious interest in purchase. I'm still confused about why the pictures you are posting now are different from the ones you posted in July on eBay, especially the engine compartment. Here is the text from your eBay listing in July and all the pictures. 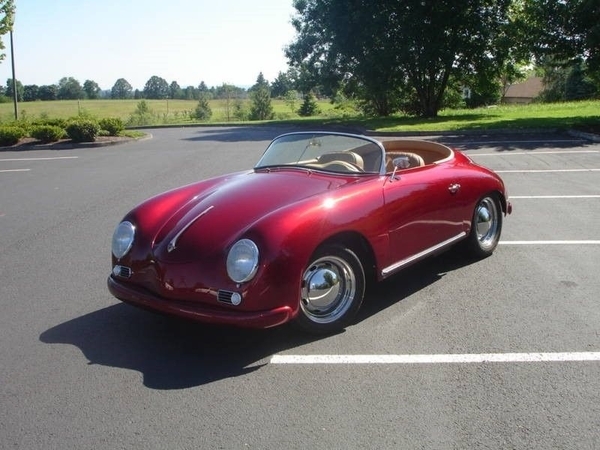 6 Porsche Speedster Replic in House Of Kolor Kandy Paint - Candy Apple Red - A Site To Behold! This Car Is Very Quick And Handling Is Superb. Custom Built in Vancouver, WA. 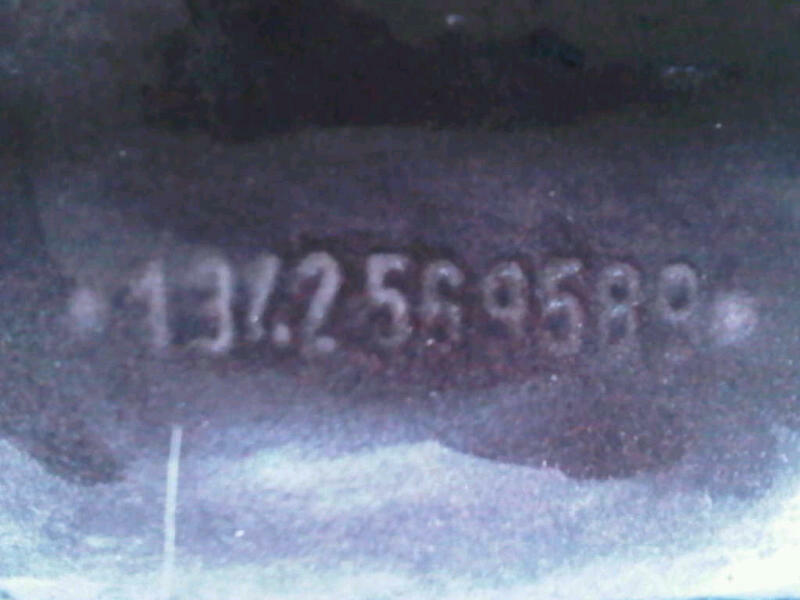 Used a 1974 VW chassis from salvaged car so VIN number is from 1974 VW. Currently registered and licensed in California as a Reconstructed vehicle--it does not have a salvage title. Full Tubular Frame Powder Coated. Not A Shortened VW Chassis. Uni-Body Type Construction. Floor Is Fiberglass And Incorporated Into The Body Unit. Independent Rear Suspension (IRS) so you can adjust the ride comfort versus the performance. Removable Hard Top included but does not currently fit correctly--can be brought to a shop to correct. 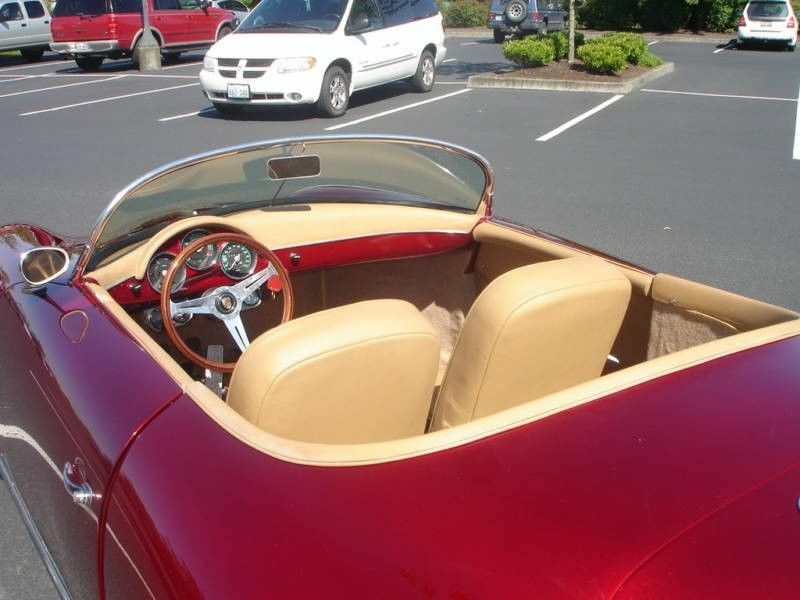 Includes Tan Soft Top With Side Curtains that drop into doors. Tops are interchangeable. The bow for the soft top has to be unbolted for the hard top to be used--a very simple procedure. Estimated 180-190 HP--really fun to drive! I have driven all 4,000+ miles. Many improvements and adjustments have been made to improve the car since I purchased it with 250 miles on it. RUNNING BETTER THAN EVER! 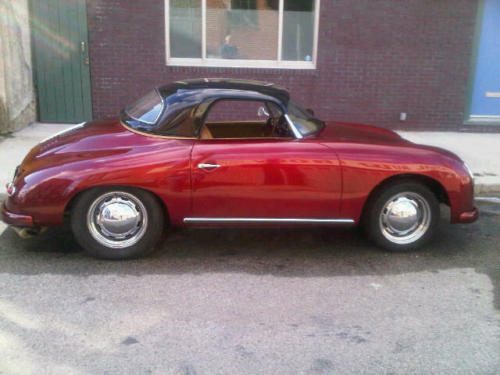 The pics with the black hardtop are from pictures taken when I lived in PA (when it fit) about 4 years ago. Notice the CO license plates versus the CA plates now. I put those on the listing to demonstrate what it looks like with the hardtop since that doesn't fit anymore (as disclosed in every post). There is probably 1,000 miles on the car engine between the 2 timeframes. I'm happy to clarify anything else. Thanks for giving me this opportunity. Did they also move the under the dash gauges into the engine compartment? What is the rectangular box next to the fuse box on the firewall? It looks like the ignition switch was moved from the right to the left side of the steering wheel and there was or is a gauge in the dash on the right side. 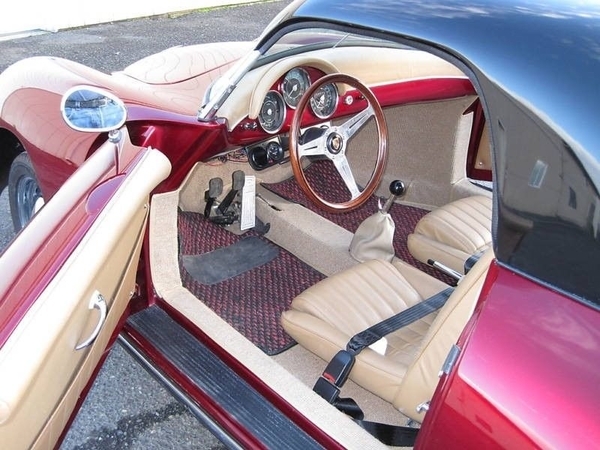 It also looks like there were no side curtain post holes in the older eBay pictures that show the door rail. Were the soft top or the curtains added after the build? I would encourage any potential buyers to look at and drive this car in person, but it does look like a rare good deal if you can live with the word salvage on the title. Meant no insult by the scam listing comment. I for one have seen them and feel we all need to be cautious of being scammed. I love your car. I hope it goes to a good home. It appears the price is a very reasonable one if not a steal! Rebecca, contact me @530-887-0800. I may have someone interested in the car. This should put you two in touch with each other. 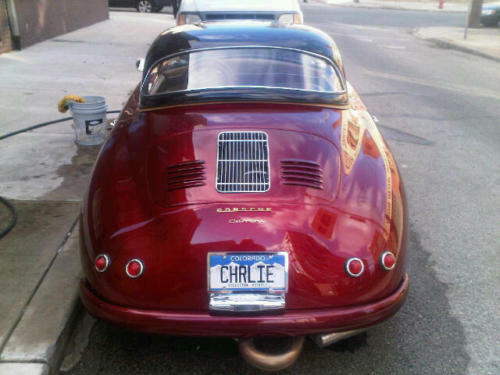 I am interested in this car and I live nearby. Can I come and see it? Good luck with the car. I love everything about the car and the price seems very good. Unfortunately, it went to another buyer. I think I am going to stick with Troy and his cars/ recommendations. I’ll see his car on 12/11.